Aserca Airlines offers 16 domestic and international destinations on direct flights and in connection with SBA Airlines and Pawa Dominicana. 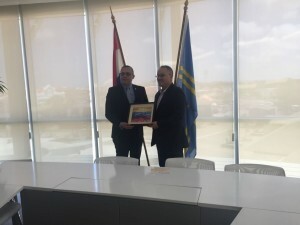 ORANJESTAD - In order to strengthen ties and tourism between Aruba and Venezuela, Luis Herrera, president of Aserca Airlines, held a meeting with Mike De Meza, Minister of Tourism and Transportation of Aruba. During this meeting, they evaluated the current offer of flights and ratified the commitment to continue increasing connectivity between both nations. Herrera highlighted the commitment of Aserca Airlines to continue betting on the aeronautical development of Venezuela to offer the citizens the possibility of carrying out their tourism and business trips inside and outside the country. “Aruba is a very important market. We are interested in strengthening alliances with the government and businessmen of the hotel and tourism sector. Currently, we have three weekly Caracas-Aruba-Caracas frequencies. We leave Maiquetía every Monday and Friday at 10:30 am and return at 12:40 pm; And every Sunday our flight leaves at 11:30 am and returns at 1:30 pm,” said the president of Aserca Airlines. He added that Aserca Airlines offers 16 national and international destinations. Within the national territory, it flies to and from Zulia, Lara, Bolívar, Falcon, Maturin and Caracas. In its international itinerary, it offers direct flights to Aruba, Curaçao and Dominican Republic. In partnership with SBA Airlines, it connects its passengers with Miami and Panama. And since October 2016 it expanded its offer of flights to connect Venezuela with the Caribbean, through Pawa Dominicana, strengthening the connectivity of Venezuela to and from Puerto Rico, Haiti, Cuba, St. Maarten and Antigua.